The times have changed dramatically in the last twenty years and Europe has expanded in terms of cooperation and empathy towards each other. We can hardly perceive now, for example, the times before fall of Berlin wall which occurred only 21 years ago or the times before Slovenia and some other European nations became independent. Since then, the transfer of knowledge became a necessity and understanding the need of harmonisation of knowledge has become the basis of European directive of free movement of people and goods. To achieve standard medical care everywhere in Europe development of the same level of knowledge is needed. As there is no university teaching without good research, there is no good medical care without good teaching. Education and research are two sides of the same coin and only merging of both creates atmosphere of progress of medical services. On a personal note, when Slovenia was still a part of ex-Yugoslavia, there were certain good research institutions with international contacts, one of such was Institute for clinical neurophysiology of University Medical Centre Ljubljana. There, research atmosphere and international collaboration has been cultivated and there I met Dr. Jelka Brecelj that already worked in the field of visual electrophysiology. I was interested in combining visual electrophysiology with clinical ophthalmology and joined professor Hisako Ikeda at St.Thomas’ Hospital in London in 1989 as PhD student. With prof.Ikeda, I was introduced into basic research and work with animals, whilst at the same time, I have had a chance to participate outstanding clinical and educational activities at St.Thomas’ Eye Department then led by Mr David Spalton. Excellent examples of collaboration among clinical and research teams have influenced my future orientation and when I returned to Ljubljana we upgraded resident education and created conditions for research infrastructure and clinically oriented research teams at Eye Hospital Ljubljana. We were successful in obtaining a number of grants and young researchers, funded by Slovenian Ministry of Science who later became ophthalmologists and nowlead their own research fields. We also conceptualised new building of University Eye Hospital and, in 2001, when we moved to new premises, many new possibilities for clinical and basic research in ophthalmology were created and also Dr. Brecelj joined our team. Since then, development of knowledge in our Eye hospital was exponential and collaboration with a number of international experts as well as collaboration of Slovenian society of ophthalmology with neighboring as well as wide spectrum of European societies made a visible impact on orientation of our young generations towards European standards. One of such standards was met by attendance to European board of Ophthalmology specialist examination where a good number our young colleagues excelled with high ranking, including first overall award for Dr. Martina Jarc-Vidmar in our first year we joined the exam in 2005. Hyperautofluorescent ring in retinitis pigmentosa is the border between functioning and non-functioning retina. As shown by the OCT, retinal photoreceptor layer is lost within the area of the ring, with corresponding loss of function outside of the ring, as shown by microperimetry. 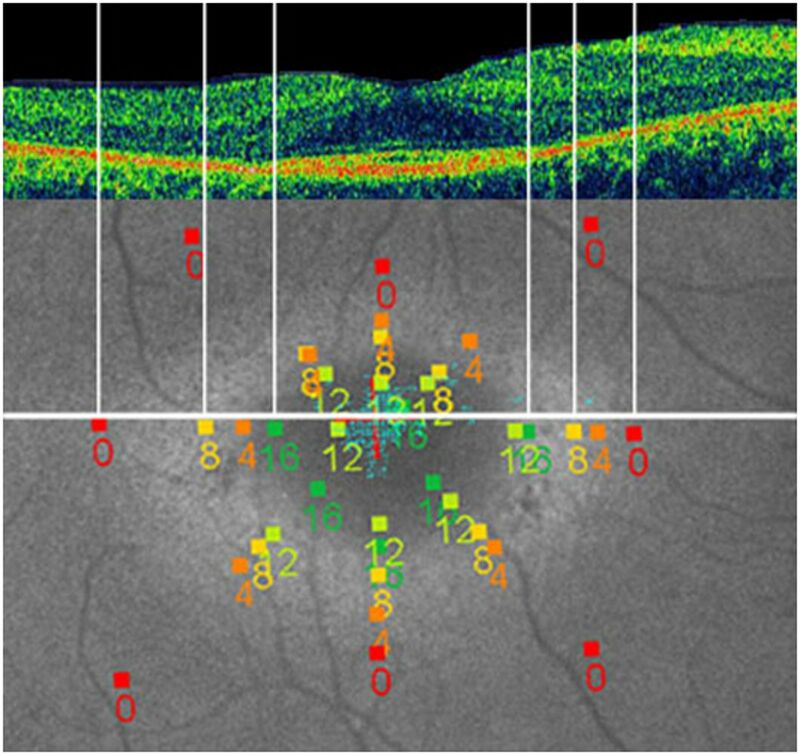 My key clinical research orientation remains visual electrophysiology and multimodal imaging in diseases of retina and optic nerve. A number of techniques such as autofluorescence imaging and spectral domain OCT developed recently that have changed the traditional approach to inherited and acquired retinal diseases. My interests extend into field of neuroophthalmology as well as in surgical approach to complicated cataracts associated with uveitis. Our basic research laboratory has recently undertook to address physiology and morphology of lens capsulae and physiology of lens epithelial cells in understanding of cataractogenesis in this disease. We are planning to extend basic translational sciences stepwise towards more complicated structures and preparations. My long-term motivation remains also in helping in collaboration amongst the supranational educational and research societies such as EBO, SOE, EVER, UEMS and EUPO, that are joined under Concordia website portal (www.ebo-online.org) to offer promising young people a hand in finding contacts and motivation for research and education which creates European atmosphere of quality and collaboration. We enjoyed also to have had a chance to host EVER congress for last 3 years in Slovenia, which has been visited also by EU commissioner for research, Dr. Janez Potocnik. Wider collaboration with institutions of Eastern Europe, through SOE and EBO and other EU programmes such as Erasmus or Marie Curie serves to harmonise education to reach the same standards of education and research. This brings hopes that the term “Eastern Europe” will soon be perceived just in geographical or preferably turistical terms. FEBO, President of EBO, Chairman of Education Committee of SOE, Board Member of ISCEV and EUNOS, Member of the Advisory Board of the ICO.